The week started out fairly normally. I had heard that the movie “How to be Single” was going to be filming 30 seconds from my apartment so I knew there was the vague chance of a celebrity sighting. I’ve seen a couple famous people in New York before, so although I was excited, I wasn’t freaking out. The only person I really cared about seeing in the HTBS cast was Rebel Wilson, but I figured the chance of it happening was slim since she’s Pitch Perfect 2 came out just last week and she might get mobbed. The filming was supposed to happen Monday morning but I was wrapped up in work all day and didn’t end up stepping out until 6 pm. 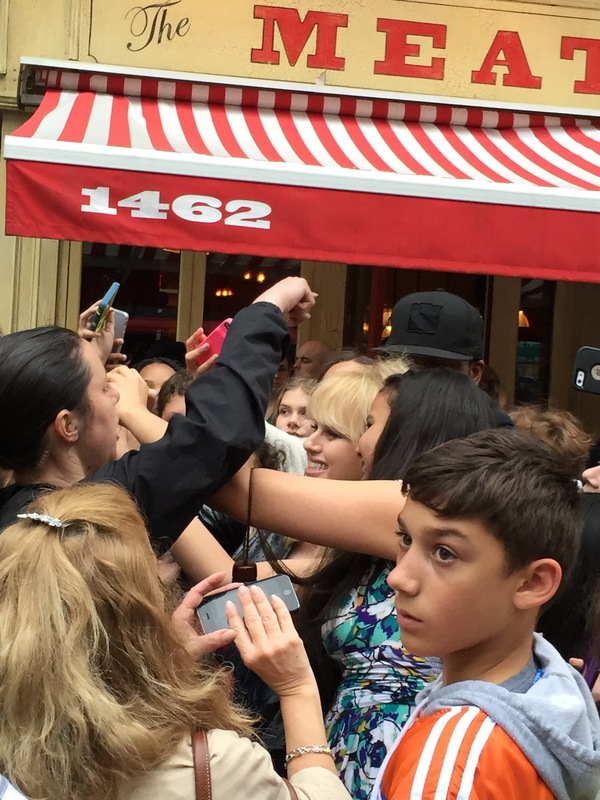 Lo and behold, I walked out of my apartment and there was Rebel Wilson happily smiling and taking endless selfies with a mob of middle-schoolers. Just as I paused to consider trying to take a picture with her, she was called away by the film people. It was just perfect lucky timing that I saw her. The next day, when I was traveling on business and sure the high point of my week had passed, I got a message from my dance company’s director, Minila, about a special opportunity. We had been invited to NBC to dance with Nick Cannon for Red Nose Day. My mind was blown. Ajna has been offered some cool opportunities in the past, but this to me was a sign that people are really starting to take notice of us. I flew back into the city on Wednesday evening and switched immediately into dance mode. We were at 30 Rock until late in the night, but when Nick finally came over and danced with us, it was exhilarating. On Friday, my friends and I had made plans to go see “Hedwig and the Angry Inch” on Broadway. I’d been wanting to see this play since Neil Patrick Harris had starred in it but hadn’t yet gotten around to it. There have been a string of talented Hedwigs but when I saw a billboard advertising that Darren Criss is the current star, I knew I had to make the time. I’ve thought of Darren as immensely talented and down-to-earth for a long time – from watching him in “A Very Potter Musical” to clips from “Glee” all the way to his features in Tyler Oakley videos on YouTube. One of the friends that I had planned with, Proma, knew Darren from working with him on AVPM, and thought that we might be able to get in to see him. I wasn’t sure it would happen because her plans were uncertain until the last minute, and we didn’t know what kind of security Darren would be surrounded with. I should have known, though, after the week I was having, that it would all work out. Darren was somehow even more down-to-earth than I’d expected. He was instantly thrilled to see Proma and very giving. 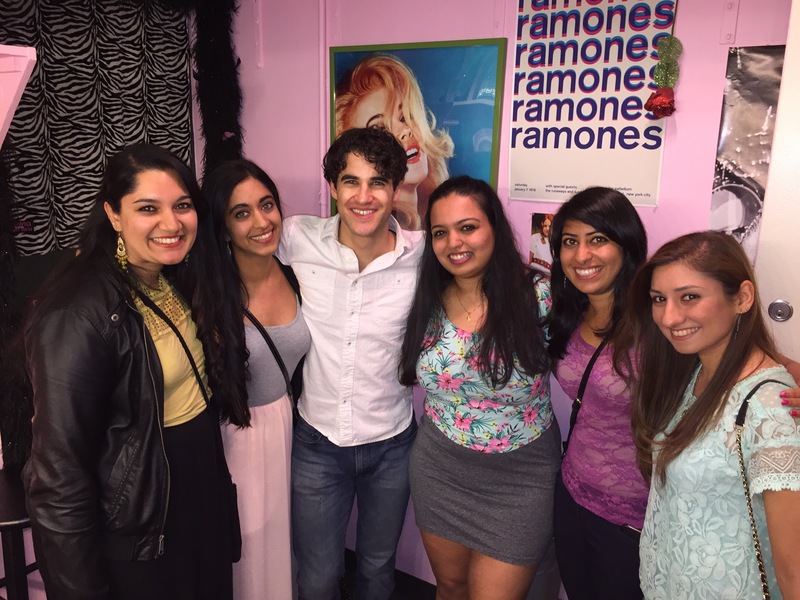 He chatted with us about the show and the many moods of Hedwig (he called her “She” like it was someone he knew rather than a character he plays), and took us to his dressing room for a pictures. His wardrobe man and manager were also very friendly. This week has been utterly surreal. In one week I encountered three celebrities in 3 completely unrelated events and in 3 very different ways. The first was basically a chance event – the kind of thing you’re told to expect, living in New York. The second was borne of the work my dance company has done over the past two and a half years. And the third was a result of making friends with some really talented and interesting people. All of it makes me love the City more than ever. And I find that the reason I’m thrilled has very little to do with celebrity. It’s really more that I know now that the things I’ve always wanted – surrounding myself with people leading interesting lives, achieving my creative goals, and living and interesting life myself are all things that are accessible.